WHEN DID YOU LAST TAKE A CPR COURSE? Crossing Latitudes Staff teach American Heart Associations’ Heart Saver CPR & AED courses. Learn how to do Cardiopulmonary Resuscitation (CPR), use a Automated External Defibrillator (AED) and relief of choking. Most courses are 3,5 hours long and we cover Adults, Children and Infants. We can come to your home, your store, restaurant, lumberyard, yoga studio, camp, bank, office, class room … or you can come to us. Check the schedule for up-coming courses or contact us to set up your own date. The price for a 3,5 hour long American Heart Association HeartSaver CPR & AED course is usually $45.00 per person. The AHA book costs $15.00 extra if you would like to purchase it. The price for a 8 hour long American Heart Association HeartSaver CPR, AED & FIRST AID course is usually $75.00 per person. Even with this serious topic we promise that you will have fun while learning. Lot’s of hands-on and realistic scenarios! Contact us if you are interested in signing up or hosting a CPR course. NÄR TOG DU EN HLR KURS SIST? Även med detta allvarliga ämne lovar vi att du kommer ha kul. Våra HLR-dockor har på sig friluftskläder och vi försöker göra praktiken så realistisk som möjligt. Ring eller email oss om du är intresserad av en kurs för din familj, vänner, arbetskamrater eller ledare. AHA or Svenska HLR Rådet CPR / AED | Any place - Ask us! | Any time - contact us! Location: You decide - contact us! Crossing Latitudes instructors are trained at the American Heart Association and the Swedish CPR Association (Svenska HLR Rådet). When did you take a CPR class last? Knowing what to do will help you all to feel comfortable and confident if someone suddenly collapses or chokes. It could be your best friend or a co-worker. Sudden cardiac arrest can happen to anyone at any time. Many people appear healthy with no known heart disease … and then it suddenly happens! In order for this very important skill to stick – one has to practice. If our course dates don’t fit your schedule … you decide when and where! We can come and teach in your store, at your gym, your lumberyard, restaurant or bank. Morning, mid-day, afternoon or evening – you decide! Please, join us for an American Heart Association Heart Saver CPR & AED course … eller en HLR kurs med Svenska HLR Rådet! We also teach Basic Life Support for Healthcare providers. Included: American Heart Association certification card, tea, coffee and snacks. American Heart Association CPR class in Bozeman. Please, join us for an American Heart Association Heartsaver® CPR & AED class. 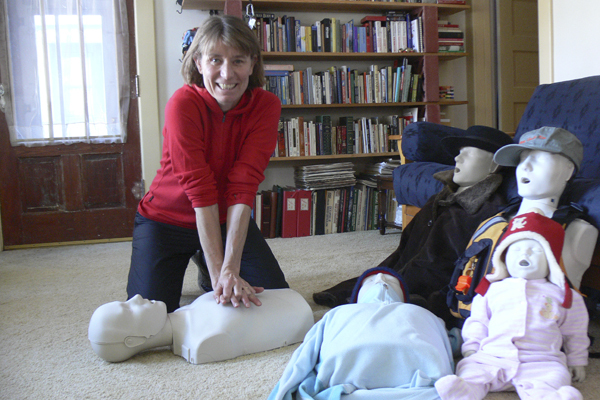 This is a classroom, instructor-led course that teaches adult, Children and Infant CPR and AED use, as well as how to relieve choking on an adult, child and infant. The course is both lecture, demonstrations and practical scenarios. WHEN: Sunday February 10, 2019 at 6:30pm to 10:00pm (3,5 hours). WHERE: Lindley Center in Bozeman. PRICE: $45.00 per person. Cash or check written out to Lena Conlan please. WHAT TO BRING: Nothing – just be ready to have fun while learning important skills. Wear comfortable clothing for kneeling on the floor. WHO CAN TAKE THE COURSE: Any one interested in learning how to save lives. Age 14 and up. This course is for anyone with limited or no medical training who needs a course completion card in CPR & AED use to meet job, regulatory or other requirements. YOUR INSTRUCTOR: Lena Conlan, WEMT, NOLS Wilderness Medicine instructor, American Heart Association instructor, owner of Crossing Latitudes. WHEN: Saturday May 18, 2019 at 6:30pm to 10:00pm (3,5 hours).